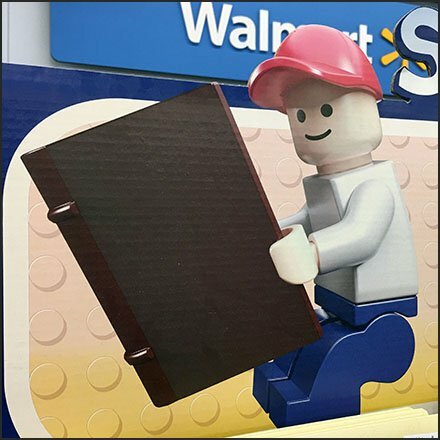 Expanding company presence is this Lego Early Readers Book Rack Branding. The Lego logo brand is second in emphasis to the Lego character, because that communicates to the young audience. The dimpled lego attachment system, seen in top view creates a branded backdrop for further recognition. Consider the design in the Lego Early Readers Book Rack Branding gallery of images. Seen at Walmart. BACKSTORY: Lego (Danish: [ˈleːɡo]; stylized as LEGO) is a line of plastic construction toys that are manufactured by The Lego Group, a privately held company based in Billund, Denmark. The company’s flagship product, Lego, consists of colourful interlocking plastic bricks accompanying an array of gears, figurines called minifigures, and various other parts. Lego pieces can be assembled and connected in many ways, to construct objects; vehicles, buildings, and working robots. Anything constructed can then be taken apart again, and the pieces used to make other objects. The Lego Group began manufacturing the interlocking toy bricks in 1949. Since then a global Lego subculture has developed. Supporting movies, games, competitions, and six Legoland amusement parks have been developed under the brand. As of July 2015, 600 billion Lego parts had been produced. In February 2015, Lego replaced Ferrari as Brand Finance‘s “world’s most powerful brand”. “Lego Fixtures Pinterest Board“ for a visual summary. “Lego Fixtures Index Page” for all resources and links.